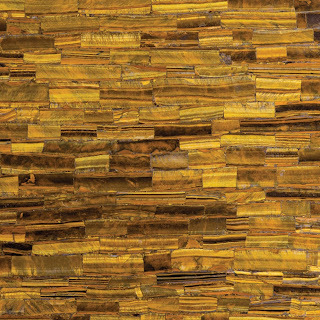 We have recently started carrying a collection from Caesarstone, Concetto; it is totally amazing. These colors are made from semi-precious stones that are hand cut! Some of these stones are rare and hard to find. It's definitely a one of a kind collection. We've found a neat product to update a boring vanity mirror. It'll save the hassle of removing the mirror from your wall and look sharp when you're done. 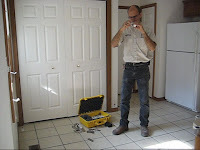 You can install the frames yourself or we can do it the same time we install a new vanity countertop. Take a peek at the video on the mirrormate website and then come in to view samples and order at our showroom. Isn't she a cutie?? 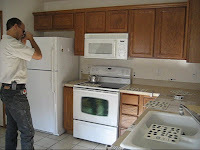 And check out the new paint job on the kitchen that was in the first blog post. Neat, eh? 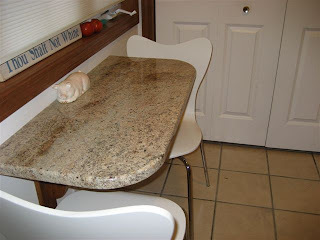 Just remember...if you're an adult, don't try perching on your countertop like this! Vetrazzo recently announced four new stunning red glass mixes.These are limited edition colors and won't last long. Red glass is a rare find for these folks! Ruby Red is made from gorgeous misshaped red goblets.Also available with a patina finish.Firehouse red has brighter, more "fiery" shades of red and dark orange. It is made from wing tip light covers, warning beacons and runway lights. Also available with a patina finish. Another limited edition available in small quantities every month is Millefiori. It is made from waste generated in the manufacturing of art glass. Curious about recycled glass? Read on. 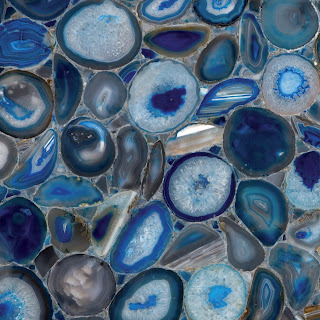 A: Vetrazzo is a stunning product used for countertops, tabletops, flooring and architectural cladding. It's made from recycled glass and a cement binder. Even the binder uses recycled fly ash-a waste by-product of coal burning power plants. Q: Where does the glass come from? How much is recycled? 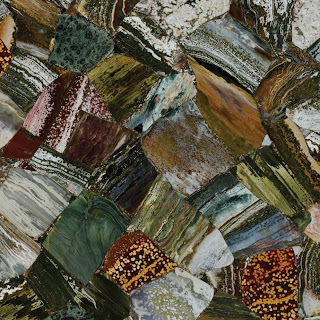 A:100% of the glass used in Vetrazzo is recycled and comprises 85% of the material. The largest source of glass is the neighborhood curbside recycling programs. Other glass comes from post-industrial usage, windows, drinking glasses, stemware, automotive glass, reclaimed glass from building demolition and other unusual sources such as decommissioned traffic light lenses. 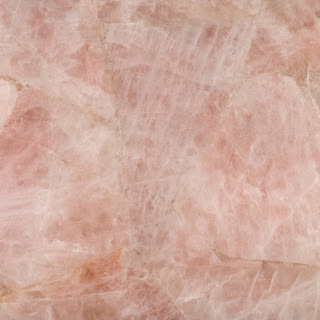 A:Vetrazzo is less porous than marble and concrete and equivalent to some granite. You do have to care for it. 85% of the surface is glass, which is impervious to stain. However, acids (like red wine, lemon juice and vinegar) will etch the matrix of the surface ( the concrete area between the glass) if not cleaned up right away. And staining agents (like coffee and tea) will leave a trace if allowed to remain on the surface. Luckily, like aged butcher block, marble and concrete, signs of living can actually enhance the character of the surface. If you clean messes up quickly, your Vetrazzo will remain unchanged. If you are more carefree, you may appreciate the natural patina that develops as you live with and enjoy your countertop. Also, dark mixes and those with patina hide the signs of a carefree lifestyle remarkably well. Q: Can you cut on it? Can you put a hot pot on it? Is it durable? A: Yes, yes and yes. However...it will dull your knives...and leaving hot pots on it for long periods of time may damage the sealer. Q: How do you take care of Vetrazzo? A: Sealant should be reapplied every year or two. It's as easy as waxing your car. Wipe it on, let it sit for 20 minutes and wipe it off. To keep the "just like new" finish, apply a wax ( like Goddard's Marble Wax) and then reapply twice a year or so. The wax barrier provides additional time for wiping up spills before they break through the sealer. Stains that refuse to wipe up can be repaired by your fabricator or if you're a true do-it-yourselfer, you can try the poultice recipe at the Vetrazzo website. Q: How do I buy Vetrazzo? A: Visit http://www.vetrazzo.com/ to find an authorized fabricator nearby. A: Yes...10 years! 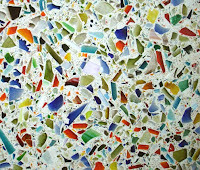 Vetrazzo will supply the material if there is a manufacturing defect and your fabricator will supply the installation. (hint: be sure to select a reputable fabricator) You will need to pay any additional fees...such as labor to reinstall plumbing. 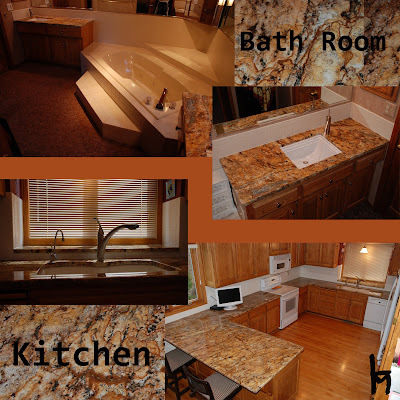 The homeowner is delighted with this recent transformation of her kitchen. 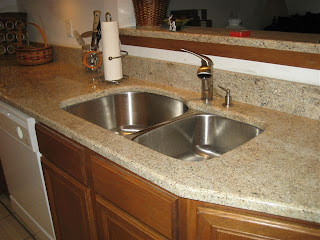 Along with beautiful granite countertops, she gained a cozy seating area under the window and an updated undermount sink, faucet and nifty soap dispenser. 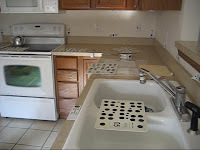 The before pictures show Loren using our digital templating system. 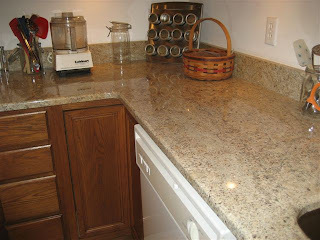 This blog is dedicated to our store in Topeka, KS; Countertop Shoppe. We are just east of Target, on the south side of 21st street. Below is a map that might help you see where we are! Check back often to learn about new products and our current projects.